Microcephaly is a medical condition in which the brain does not develop properly resulting in a smaller than normal head. Microcephaly may be present at birth or it may develop in the first few years of life. Microcephaly disease is a condition where a baby’s head is much smaller than expected. During pregnancy, a baby’s head grows because the baby’s brain grows. 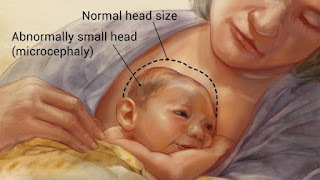 Microcephaly can occur because a baby’s brain has not developed properly during pregnancy or has stopped growing after birth, which results in a smaller head size. Microcephaly can be an isolated condition, meaning that it can occur with no other major birth defects, or it can occur in combination with other major birth defects.